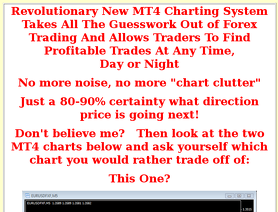 weill i m using his nine ball renko system togther with fibo pivot res and sup my goal is 20 - 30 pips a day . His hedge fund is down >50%. The Renko thing is available for free - just surf around a bit and you will find it. No discipline. His own technique changes... BY THE DAY! Go to his room and check it out - flipping a coin would give you better odds... seriously. 100 pip stop today on a 1m trade with a very small tp goal. I don't know about all the stuff people have posted here in the past regarding this Jeff Glenellis guy, but I have his Renko bar charting system, and it works really well. I am trading with more confidence than ever and am finding more trade opportunities than with standard bar or candlestick charts. I use it with the true MACD indicator that comes with Meta Trader, along with this great trade manager EA I found a while back. Making pips every day. Hint: Look for it on Ebay. His book was introduction to forex and I thought a pretty good one for explaining the general idea. I have been sorely disappointed in his attempts to provide trade signals. I signed up months ago and have received a total of three signals, two of which lost. He's now advertising another signal service using a VPS. As much as I would like to believe he's for real, I can't. I won't waste any more time or money with this guy. This guy is a Ringer, he will give you all the excuses in the world and is always working on something new to get your money. He also started a Hedge Fund for Forex and charges 20% commission daily whether you make money or not. His website is now under repair. Save your money ! simple breakout and moving averages. Best part is he will not respond to any emails. I have tried for at least 6 months to no avail. HE TAKES YOUR MONEY AND RUNS. JEFF IS A BUM. I contacted the author and he gave me a sample of the first two chapters. From that i figured that it probably it is not worth the purchase. The first two chapters are full of stories, tells you that he is going to show you a trade, but never does only fills the two chapters with filler paragraphs of platitutes and irrelevant stories. I cannot say whether or not the book is good, but i don't trust this type of hype. The author should give us a chapter with an example of an actual trade to demonstrate his strategy; instead he gives us his life story and the around the corner promise to show how to trade. Have received his non-member trades in the past. Purchased the book very recently. His 6 weeks trading log is a very good example and is very encouraging. Have made more with his scalp technique in a day than the book cost. He now provides calls via email included in cost of the ebook. I received 2 today. He has responded promptly to every email I have sent him. Every couple months or so he puts out a nice email saying how he's going to start sending out free signals to those who purchased his course but will start charging for these soon for non-members so better buy his course now. This is clearly now just another attempt to get more sales with no intention on sending signals/alerts. He never replied to the multiple emails I sent him over these past 8 months nor gives any kind of updates. I would rate this a scam except his ebook is what got me interested in forex. His total lack of customer service is truly a shame as he seemed like a decent guy. Don't waste your hard earned cash on this. It's just another MA system, not worth the money. Customers care is nonexistant. All my emails remained unanswered, so it is impossible to get your money back.